FIRST AND FOREMOST: To all of you in NJ and NY- we send our loving concern and hopes for a return to normal life as soon as possible! A major shout-out to our friend Cindy who took in my parents to share in the bounty of her generator-powered home all this week and who knows for how much longer. She is a blessing and a godsend. 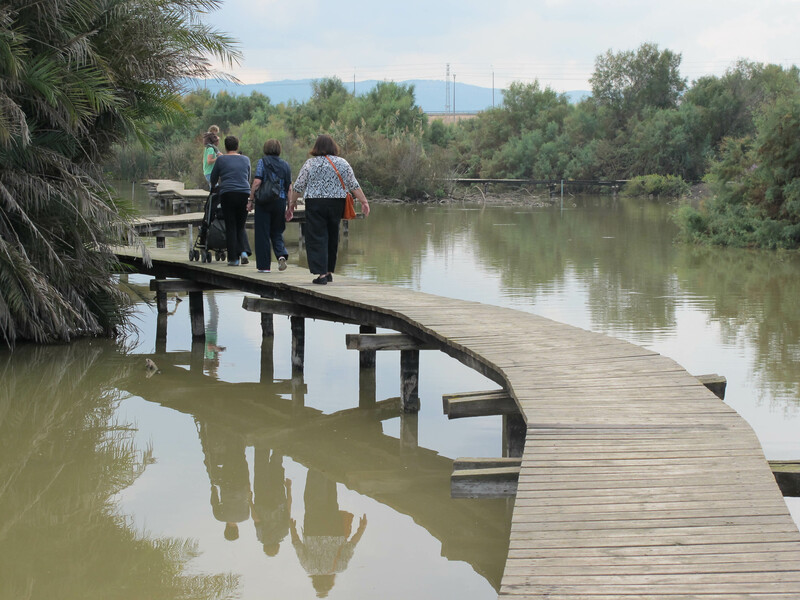 While NJ was being pounded by Sandy and her aftermath, Chuck and I were on a tiyul (a trip) around Israel for a week and thus had no blog posts. We had a wonderful, interesting, delightful time and I will be posting a few entries in the next few days to share beautiful pictures and stories. In the Bible, it says, “If I forget thee O Jerusalem, I will forget my right arm.” I have no desire to lose my right arm, but we sort of forgot Jerusalem. 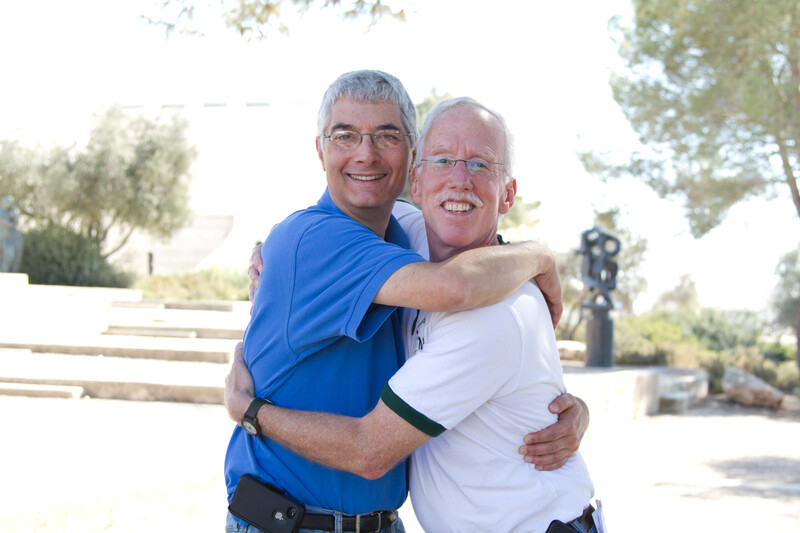 For Chuck and me, Jerusalem has always been our home in Israel and we were Jerusalem snobs in a way. But, for this long visit, we decided to make Tel Aviv our home base. Tel Aviv is the happening place in Israel, sometimes called the Jewish Barcelona, and Jerusalem, as spiritual and historical as it is, is somewhat a sleepy town. Its population has become ultra-religious and that isn’t always comfortable for those of us who are not. Both of us thought we should try living in Tel Aviv. As you know, we’ve been very happy in Tel Aviv. But this past week was our traveling week with a rented car. We spent a lovely Shabbat in Haifa with my cousin Zilla, her father, brother, sister’s family, and her children and grandchildren (there were 25 of us for Shabbat dinner including 12 children under age 12). 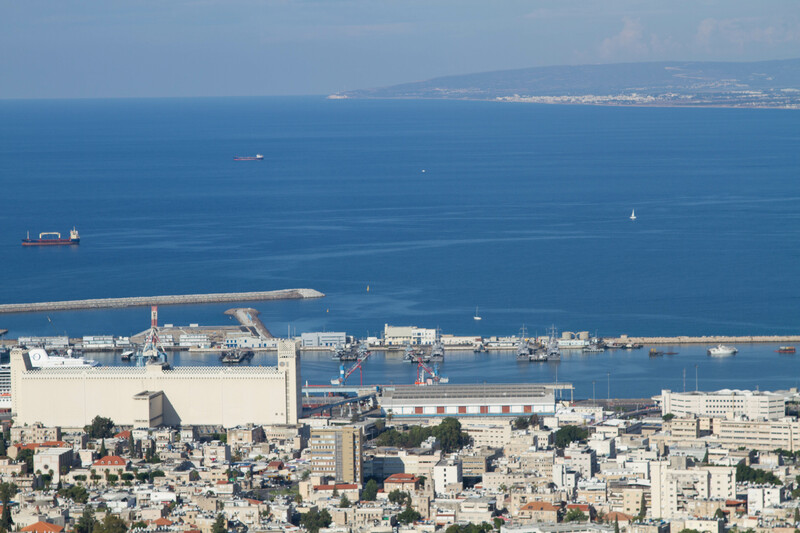 Here’s the view of the Haifa harbor and the whole northern coast of Israel from her apartment. During the day, we went to a nature preserve and saw lots of egrets (and learned the word for egret in Hebrew- Anafah) and young human families with children. 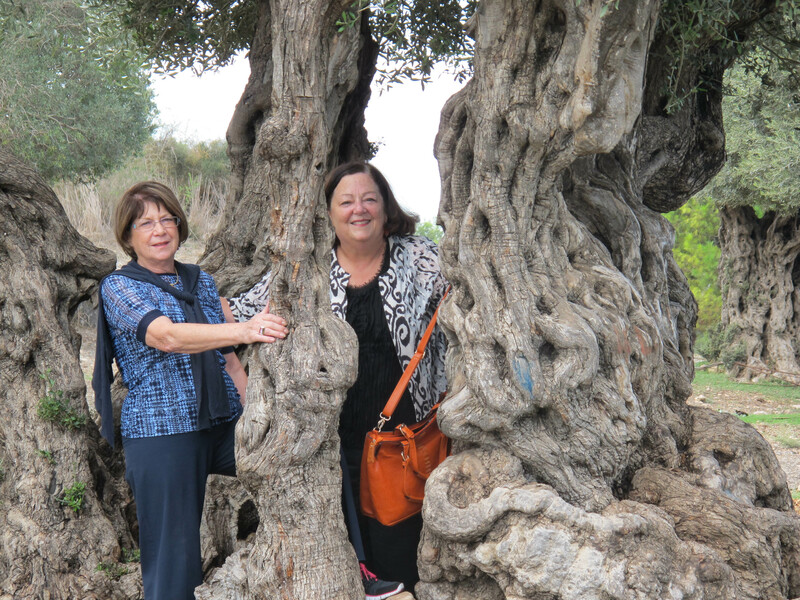 Here are Zilla and me in an ancient olive tree and on the path over the water. We came to Jerusalem on Saturday night, October 27th. Even at night, it was magical, mystical and mysterious. Going to Jerusalem is called going up-both literally and figuratively. For us, it is full of memories and meaning, both ancient and personal, and Jerusalem evokes deep emotion in us. 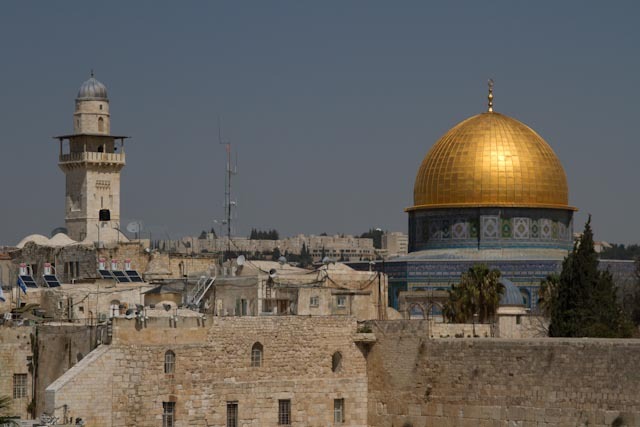 Here’s one of Chuck’s shots of the Old City with the Muslim Dome of the Rock and the Christian Church of the Holy Sepulchre. Our friends Lee and Mira, whom I’ve known since I was 11 years old and they were newlyweds working at Camp Ramah, hosted us and we have stayed at their home on French Hill so many times over the years, it feels like our home in Jerusalem. Sunday morning, Chuck and I just wandered around Jerusalem and bathed in its beauty and familiarity. 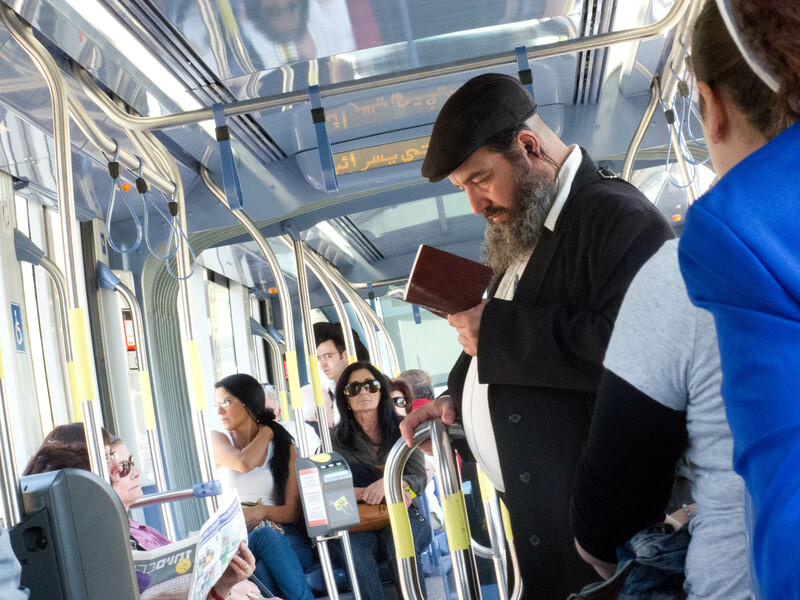 We took the new light rail from Lee and Mira’s house to downtown Jerusalem and it was fast, clean and fascinating. 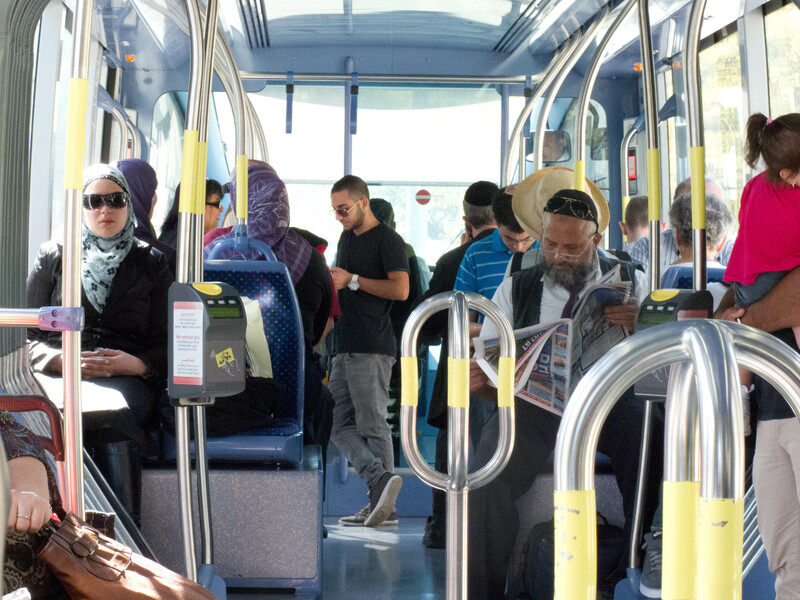 Watching the people get on and off the train was an opportunity to see the full spectrum of Israelis- Arab families, Hasidic Jewish families, soldiers with their machine guns, secular Israelis- all kind of head-coverings and dress-all together on the train. Here are some pictures Chuck took on the train. Later as we walked around, Chuck and I admitted to each other how glad we were to be in Jerusalem and how much we had missed it, without even knowing it. Every building is covered in Jerusalem stone and at different times of day, the stone takes on pink, gold and sand colors. This visit we were happy to see so many Arab families in the parks and shops of West Jerusalem- that is as it should be, but we had never seen it before. Part of it was because the Muslim Arabs were celebrating an Id holiday and not working or going to school, but to see Arabs comfortable in West Jerusalem (the newer, Jewish part of the city) was lovely. In the afternoon, we had a very special experience, going to an archeological site near Bethlehem called Herodion that was King Herod’s summer palace. 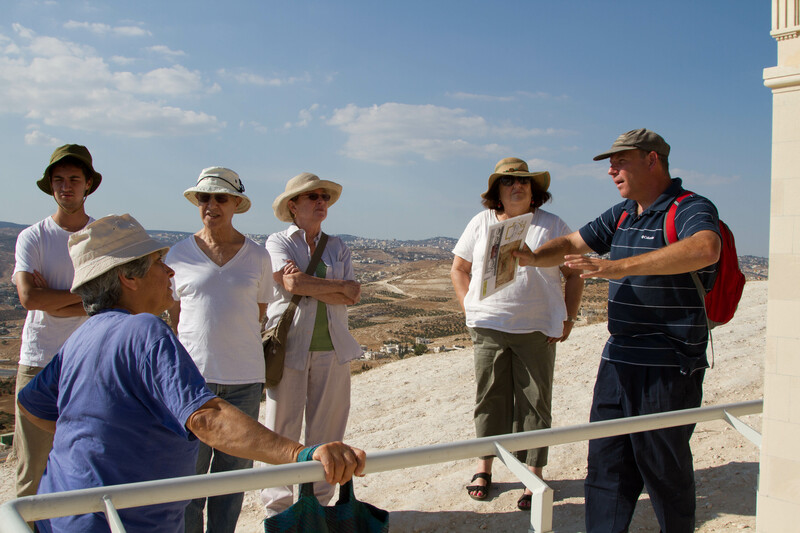 Lee, a historian-archeologist, had arranged a private tour with the Chief Archeologist on the site. He gave us wonderful historical and archeological perspectives and we learned a lot. It’s been a long time since we visited a dig and it was full of surprises and interesting finds. 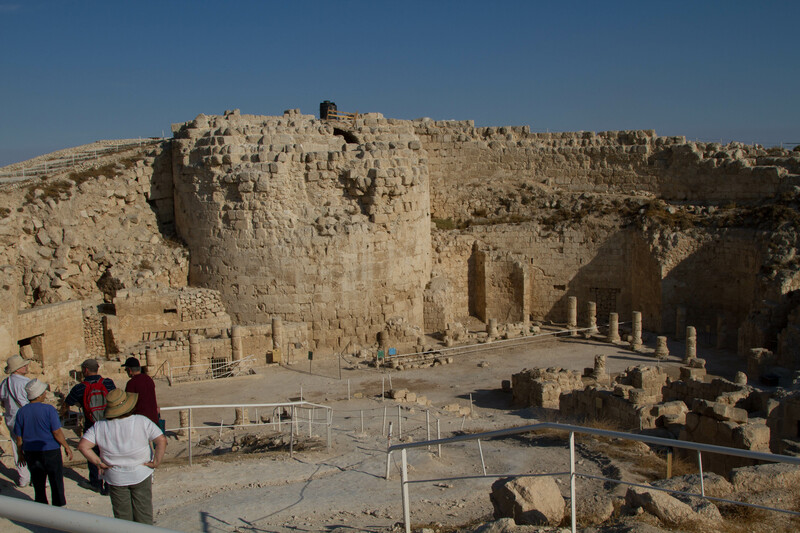 There is strong evidence that they found Herod’s tomb here. Here are some pictures at the site. The second one is of Herod’s palace. 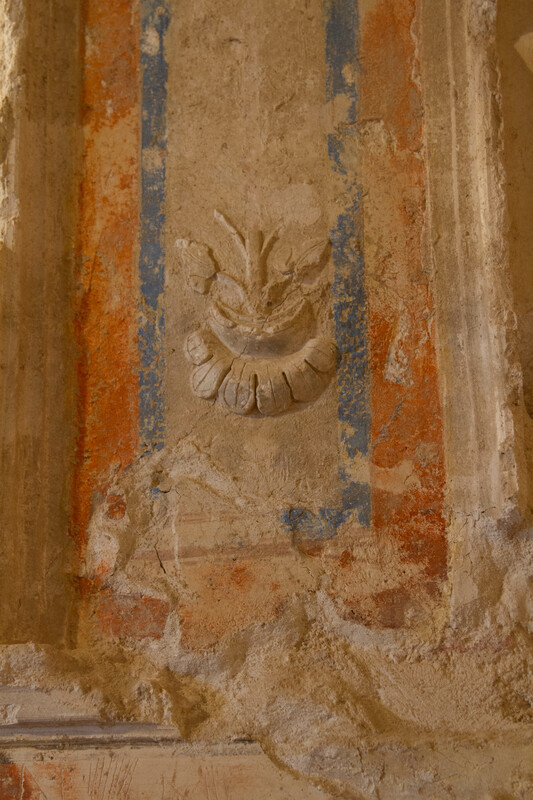 We were able to go into part of the site that is closed to the public- to the former Royal Chambers behind the amphitheater, where there are still frescos and stucco molding intact. It was beautiful as you can see. 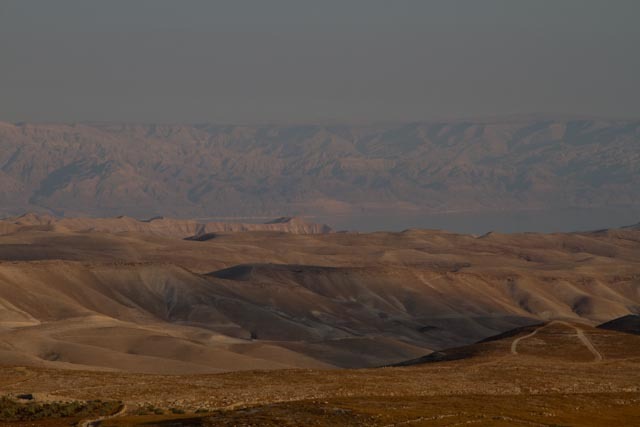 The view from the top where Herod’s palace stood was stunning, including the Dead Sea, the Judean Hills, and Bethlehem. and inside at a fascinating photo, video, clothing, and ritual objects exhibit on Hasidic Jewish life. It was surreal that we were enjoying a perfect, sunny day in Jerusalem while Cindy, Jay’s wife, was home in a hurricane with my parents! Two days in Jerusalem was too short, but it was onward to the Negev for our next adventure. Sometimes it’s a good thing that it’s a small world, other times, not so good. First for the recent good examples. 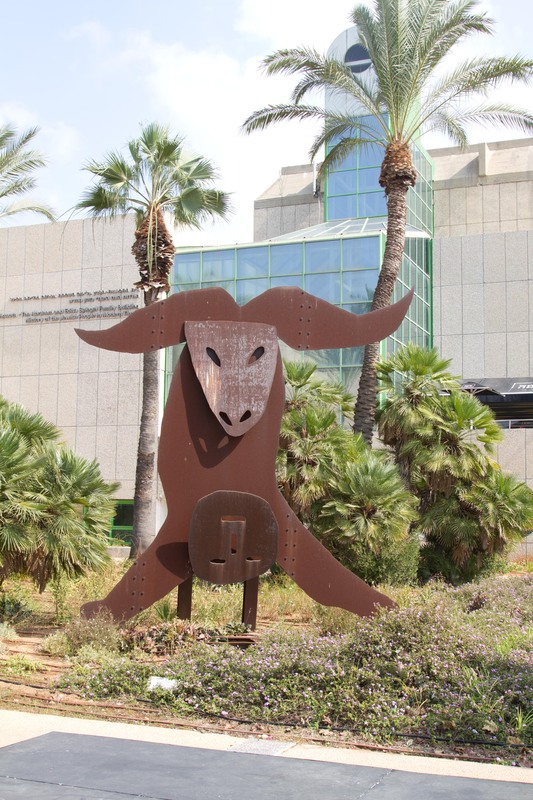 On Monday we went on an architectural and art tour of Tel Aviv University. 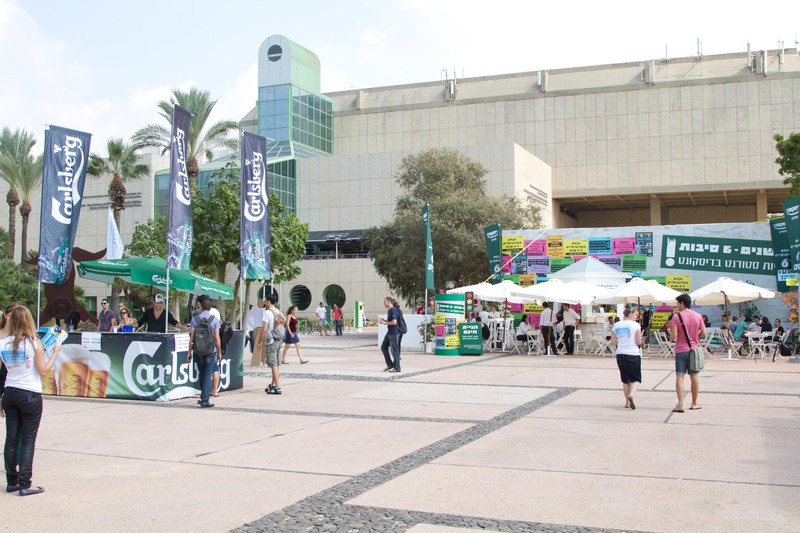 It’s the largest university in Israel, with almost 30,000 students and it was the first week of classes for the fall semester. (They don’t start until all the fall Jewish holidays are over, but they end much later in June.) I felt right at home with eager young people wandering around the campus and lots of vendors for banks, credit cards, student organizations, food and flea market items everywhere. Students all over the world have the same look, except here they’re a bit older because they serve in the army before university, so they’re 22-24 when they start studying. The campus is beautiful and has lots of outdoor sculptures and a few interesting buildings in addition to the ugly concrete ones (called Brutalism style) built in the 70’s-90’s. Here are some of Chuck’s photos, including one of the beautiful Cymbalista synagogue on campus in the first picture. The walking tour group chatted before we began and we quickly discovered that the South African/Canadian woman with us is a cousin of my sister and brother-in-law’s best friends in Canada. Amazing. After the tour, we went to a coffee shop on campus for a bite to eat, and there was Yoav Levine, the grandson of our dear friends Lee and Mira who made aliyah many years ago! He spotted us and said, “What are you doing here? This is my university!” What were the chances with 30,000 students? He is studying physics and electrical engineering at age 24. Now for the not so great small world examples. There was an editorial in the Jerusalem Post last week about standardized test scores and teacher education quality that could have been taken from any US newspaper editorial. Here’s an excerpt. Finally, all the best school systems make sure every child – whether a weak or a strong student – benefits from the excellent instruction provided by outstanding teachers. These were the uncontested findings of a study titled “How the world’s best-performing school systems come out on top” carried out by McKinsey & Company, the international consulting firm, between May 2006 and March 2007. And the findings, which state the obvious – one cannot give what one does not have – remain true to this day. The question is how do we attract outstanding men and women to a profession that has suffered for so long from a justly deserved bad reputation? Implementing more far-reaching reforms will inevitably clash with the interests of our nation’s strong teachers’ union and the myriad teachers’ training programs that produce thousands of tuition-paying graduates every year who often make mediocre educators, if they manage to find a job. But with election season upon us, voters should take advantage of the opportunity to demand of politicians clear programs for action aimed at improving our education system.The future of the Jewish state depends on producing the next generation of men and women capable of competing in a global economy that has become increasingly more demanding. When in doubt about how to fix the complex problems of public schooling, blame teachers, unions, and teacher preparation programs wherever you are in the world! Would that it were that simple, here and in the U.S. Even more depressing were the reports of the significant achievement gap between Jewish and Arab Israelis- another small world theme regarding oppressed minority groups, be they African American or Israeli Arab. The recent Israeli national achievement test results are out, and the achievement gap is getting worse rather than better. Israeli Arabs may have a higher standard of living than Arabs in nearby countries, but it’s lower than the standard of living of Israeli Jews. I was reminded even more of how imperfect and even disturbing Israeli society can be when I read in yesterday’s paper about a survey showing that large percentages of Jewish Israelis want separate societies for Jews and Arabs and would not want to live near Arabs or send their children to school with them. It sickens me even further that the more religious the population segment, the more pronounced these racist views are. How can one reconcile these views with the notion that all human beings, not just Jews, are created in God’s image? We have a long way to go towards social justice here as we do in the U.S. It is indeed a small world. Here’s our new favorite neighborhood eatery. Falafel Gabi is around the corner from our apartment – mostly outdoor tables with a counter outside and it’s always packed all hours of the day. It’s kosher, which is great for us and besides delicious falafel, they have 5 or so homemade soups everyday that are very popular. What’s amazing is how many people sit outside in the heat eating these thick, hot soups! When it cools off, we’ll try the soups. Those of you who know us, know that Chuck and I are foodies. Wherever we go in the world, we research the best restaurants and we’ve been to some amazing gourmet restaurants- from the French Laundry in Napa, to Gordon Ramsey in London (where Chuck declared our lunch was the most expensive dinner we’d ever had…) to Le Bernadin in New York. So, part of my preparation for this trip was reading about all the hottest restaurants in Tel Aviv and there are many with well-known chefs and expensive menus. I even made a list of the ones I wanted to try out. So far, we haven’t gotten to one of the expensive, fancy places. Why? 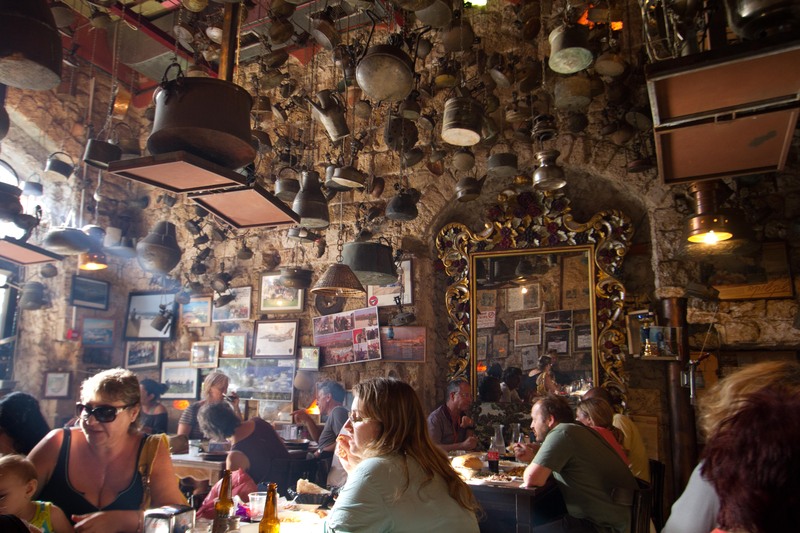 There is so much good food in Tel Aviv besides the top chef establishments, we’ve eaten well and enjoyed ourselves at home, at ethnic spots of all kinds, in neighborhood holes in the wall with outstanding food, and on the street. On Sunday, we went to Yaffo, the ancient port city next to and annexed to the municipality of Tel Aviv where Jews, Muslims and Christians live. Its beautiful old buildings and charming alleys leading down to the harbor are a haven for galleries and artists and tourists. 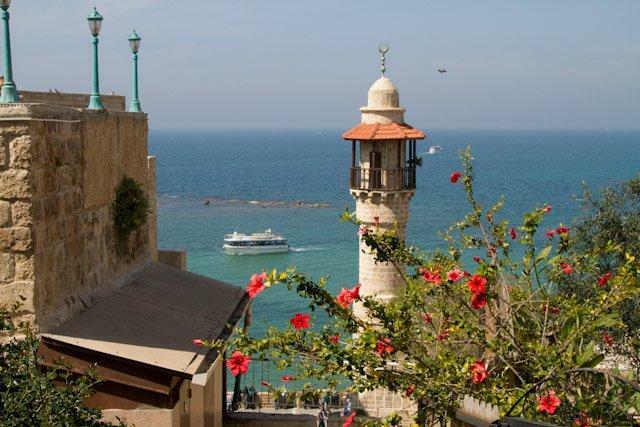 The header picture on my blog is one of Chuck’s photos of Jaffa from our last trip to Israel. It’s lovely. While there we ate a late lunch at Dr. Shakshouka. Here’s the interior. Shakshouka is an Arab/Sephardic-Israeli dish that consists of tomatoes, onions, spices, oil, and garlic cooked and served in a skillet, topped with poached eggs. Dr. Shaksouka is the most famous place to eat this dish and while we wanted some, we also wanted to try other Sephardic dishes on the menu. Lo and behold they had an Israeli version of a tasting menu. We thought the dishes would come in courses, but no, they came all at once, about 12 different dishes, including shakshouka. (I can just imagine what Michelin would say about the elegant service and ambience!) Salads of all kinds, tehina, spicy vegetable soup, various meat stews and concoctions, couscous, pickled vegetables- I can’t even remember everything. For 89 shekels a person (about $23) we also got a pitcher of lemonade, bread, coffee and dessert. What a deal and it was kosher and delicious. Needless to say, we didn’t eat dinner on Sunday! We mostly eat breakfast at home, although we’ve had a couple of incredible breakfasts out. We even went to a restaurant that only serves breakfast 24 hours a day, so we went for lunch! Israeli breakfasts in restaurants consist of two eggs, chopped salad, cheeses, olives, a bit of tuna salad, breads, spreads and butter, and juice and coffee. It’s a lot, but so good and we have two favorite cafes for breakfast and for 4 o’clock coffee or tea in the neighborhood- Bialik (a famous one) and Mersand where we saw the movie sign and the sideways tow truck in an earlier post. Anyway, one thing we love about breakfast at home here is the incredible quality of dairy products. Chuck is a lover of cottage cheese and he says it’s the best he’s ever had, I eat the yogurt that is unbelievably smooth and creamy, and we bought various other cheeses that have been outstanding. Not sure what the difference is, but some of it is incredible freshness. Chuck uses milk in his cereal and the milk turned sour much faster than we’re used to at home. Last night we went out for sushi, which is very popular here. The menu was in English and in Hebrew and that turned out to be funny as the words are the same in both languages- Spicy tuna, spicy tofu, etc. The use of English words in cooking and eating is pervasive. Grill, medium rare, hamburger, sandwich (sometimes they use the Hebrew word krich), banana- all “Hebrew” words! And speaking of hamburger joints- they are just as popular here as they are in the States right now. It’s not only food words that are borrowed from English- today I had my first Israeli manicure (pronounced mon-ee-kor). Remember Hebrew was a dead language for hundreds of years and when Zionists revived it, there were no modern words. Although there is an official Academy for the Hebrew Language to develop new words from ancient roots for new things, often the English word is used more commonly. For instance, the Hebrew word for car is Michoneet, but most people say auto. To send a text message is to samais someone, from SMS. But then the idiosyncrasies of Hebrew is a whole other topic! I haven’t wanted to write a travelogue in this blog, but there have been many encounters and experiences I want to share. 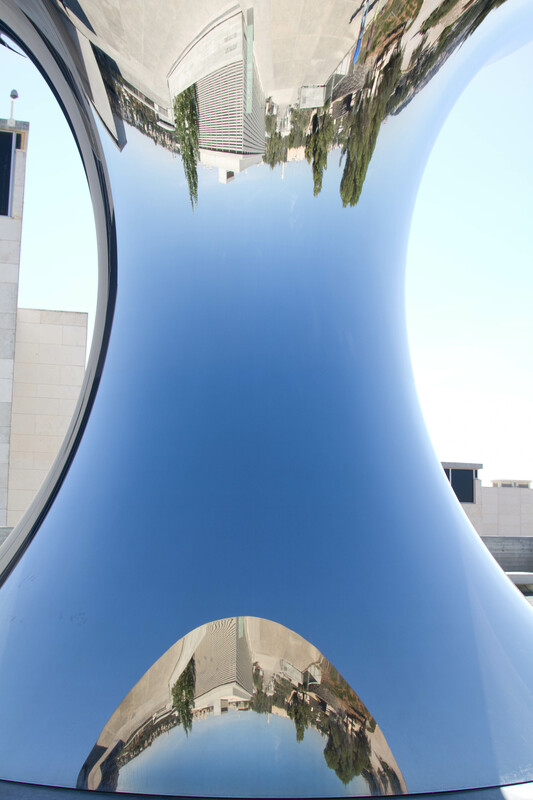 So here comes a random assortment of reflections on life in Israel. This is the name of the outdoor shuk or market in Tel Aviv and it’s quite something. Fresh produce, olives, bakeries, spices, oils, meats, fish, cheeses, eggs, clothing, housewares- you name it and it’s there in multiples. Colorful, interesting and delicious! Chuck and I were there during the week and it was interesting and we thought it was full of people. Oh my- little did we know! In Israel, most people are off from work on Friday and Saturday and Friday is the biggest shopping day of the week in preparation for Shabbat. We returned on Friday afternoon after our Graffiti tour and lunch. Here’s a hint of what it looked like! It was 86 degrees outside the shuk and probably 95 inside. Both of us were literally drenched. At one point, Chuck and I got separated and if we had not had two cell phones, we never could have found each other again in the shuk! 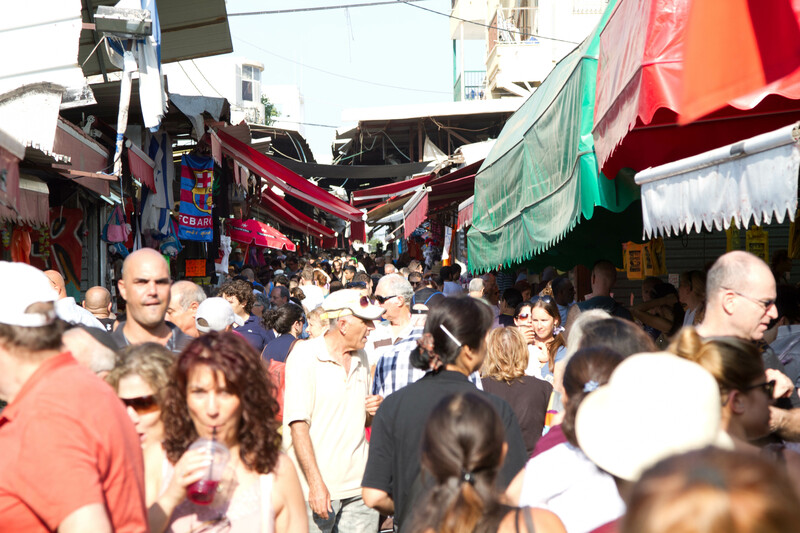 I suffer from mild claustrophobia and I think this may be our last trip to the shuk on Friday afternoon. Between the crush of pushy Israelis and their strollers and shopping carts, it felt dangerous! There’s always Thursday…. 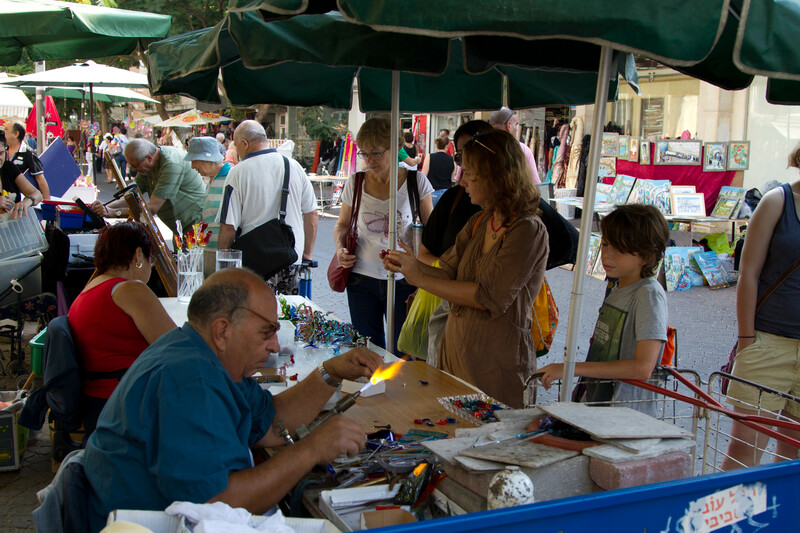 Very close to the market is a pedestrian street which, on Tuesdays and Fridays, is lined with arts and crafts vendors. We went there early Friday morning and the work was very high quality- ceramics, jewelry, photographs, glass. We bought a few photographs taken at the Wailing Wall from a Rumanian immigrant- very beautiful. At first, it seemed strange to buy photographs since we have so many of Chuck’s in the house, but then I reminded Chuck that even famous artists buy works of other artists! Shabbat in Israel, take two. Chuck and I went to Friday night services for the beginning of Shabbat. When we were here a year and a half ago, we went to the same congregation and enjoyed the service so much, we wanted to go back. 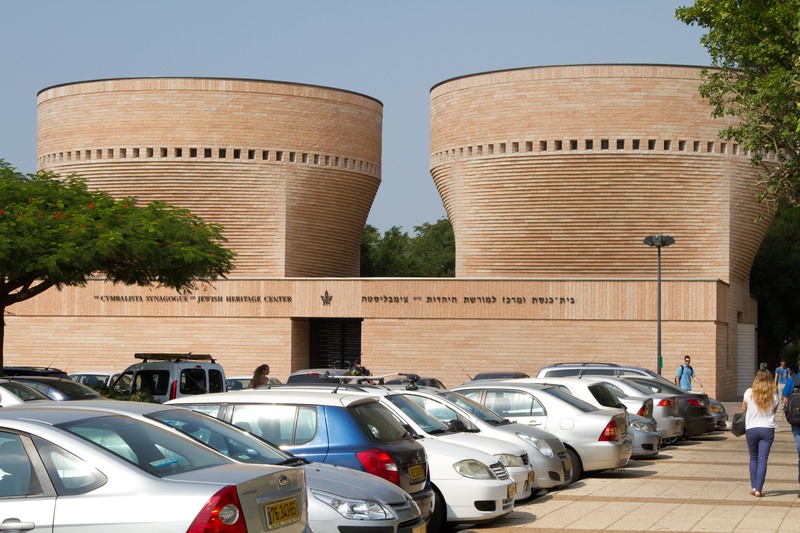 Beit Tefilah Yisraeli (Israeli House of Prayer) is a liberal, egalitarian, independent congregation that also sponsors social action projects and study groups. The services have very spirited and spiritual singing and dancing with musical accompaniment. During the summer, they pray on the beach; the rest of the year they meet in a community center. Some of the people we met come from outside Tel Aviv to be a part of Beit Tefilah because it offers a synagogue experience that is welcoming and accepting of all. My sense is there are many Israelis who long for a community experience of prayer, but who feel alienated from the rigid orthodoxy in state supported synagogues. The Rabbi is from Argentina and he has a warm and open demeanor that invites participation and comfort. Everyone new is asked to introduce themselves and there is an opportunity for individuals to say what they are grateful for this Shabbat. There was a family with five sons there from Eilat who were preparing to celebrate the oldest’s Bar Mitzvah the next morning. They were clearly secular Israelis, but they were full of joy at this milestone event. (We were told their families are here in Tel Aviv, thus the trek for them from Eilat for the Bar Mitzvah.) Chuck and I felt very at home and it was a lovely way to welcome Shabbat. We had a leisurely Shabbat morning at home, sitting on our patio and reading. 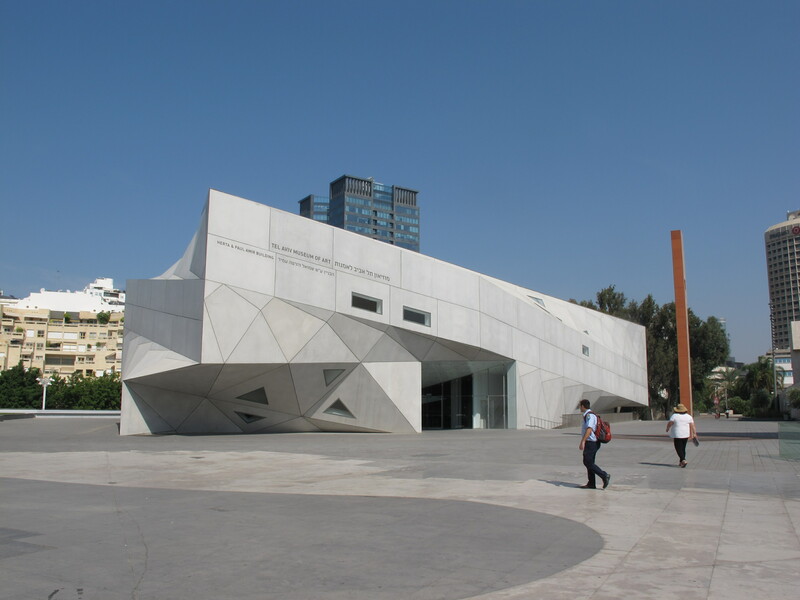 Later in the day, we went to the Museum of the Land of Israel and it was very quiet and peaceful there. One of the exhibits was photographs accompanied by life stories of Israeli families of all kinds and backgrounds taken from a newspaper series that ran for ten years. The photos were beautiful and the stories amazing. Chuck and I spent a couple of hours reading them in Hebrew and helping each other understand. My brain was tired at the end, but we both really enjoyed the exhibit. I’m a friendly person in general, but here it’s hard not to be as Israelis are always game for conversation and/or a political argument. The little convenience stall down the street from us is where we pick up the newspaper and there we had a conversation with the storekeeper that has been repeated elsewhere. He was watching Fox News and I asked him if he liked the “stories” Fox News tells instead of news. He animatedly told us he HATES, HATES, HATES CNN because it’s so biased against Israel and so pro-Palestinian. He went on to say what we hear and read over and over- Obama has been the worst US president ever for Israel- how could he publicly snub Netanyahu like that? “Romney has to win for Israel’s sake and the only thing I care about in the US election is Israel.” I explained that as an American I certainly care about a candidate’s position on Israel, but I also have to care about many other issues. Bottom line is, most Israelis don’t like or trust Obama. The other topic in casual encounters with Israelis is their inevitable relatives (children, siblings, cousins) in America. Sometimes it seems amazing that there are so many Israelis left in Israel! Israelis in general do not mince words and no topic or question is considered taboo. It’s routine to ask how much you paid for your purse, your house, anything. They also embrace you quickly, both literally and figuratively. Paula is the woman who takes care of our apartment and the other ones in the building that our landlord rents out. She doesn’t speak much English, so she loves that we speak Hebrew. She told us the other night that my Hebrew was better than Chuck’s and when he looked offended, she shrugged and said, “I just tell the truth.” She hugs and kisses me and invites us in to her apartment every time I knock on her door for something. 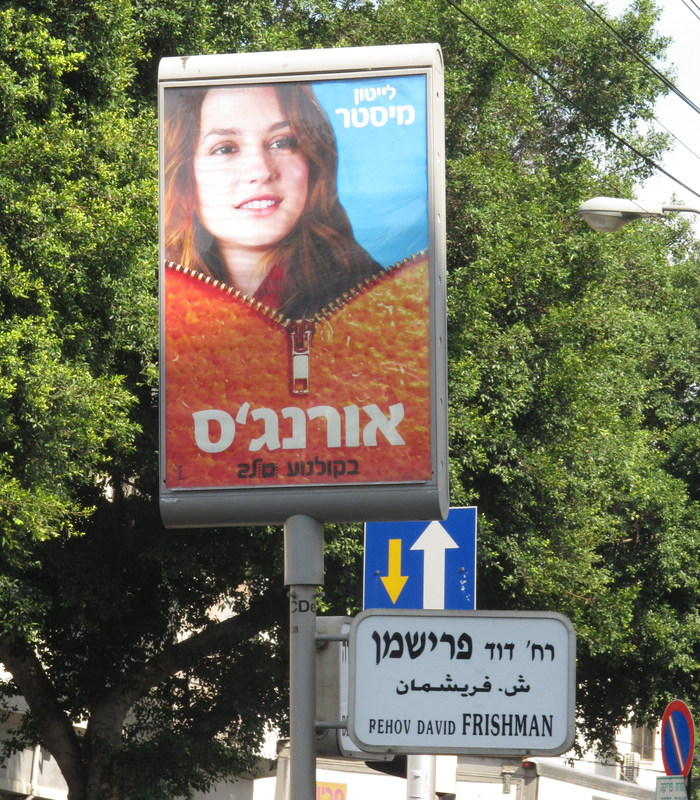 She brought us freshly popped popcorn the other day- not a typical Israeli snack. We are family to her now. Here’s a funny story. Paula cleans for us and does our laundry. She did a terrific job, but took it upon herself to completely rearrange our clothing and belongings we had put away on shelves and in cabinets. She proudly told us she made more room for us, didn’t it look better? Despite that incursion into our privacy, she told me she hadn’t cleaned the inside of the refrigerator because she hadn’t asked permission and she would never look inside someone else’s refrigerator. “It’s not my business what food you eat!” But it is her business to go through our underwear, toiletries, and belongings! If you’d like to see more of Chuck’s beautiful photos with his commentaries, you can click on the sidebar at the top of the blog page that David so kindly installed. If you click on one, you can advance to others easily. Thanks David! 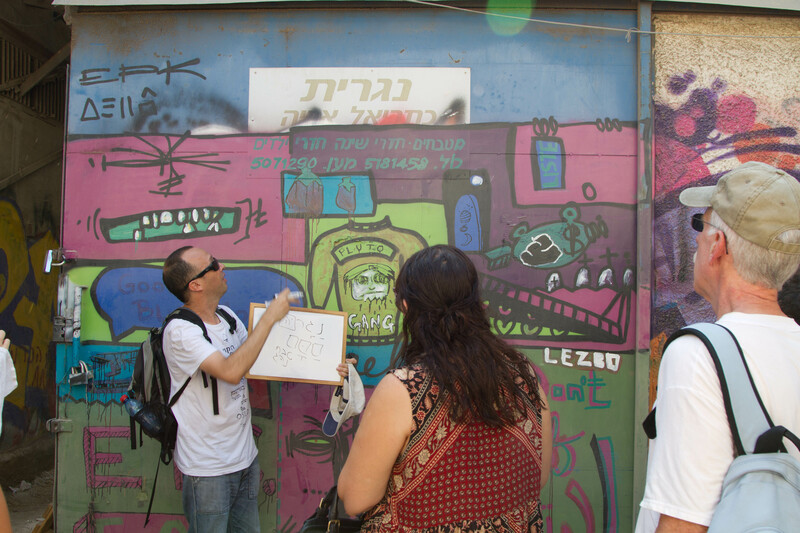 Friday, we participated in Guy Sharett’s Graffiti Tour of the Florentin neighborhood of Tel Aviv as I told you in a previous post. It was a vivid lesson of what a difference it makes, in terms of engagement and retention, when learning takes place in an authentic context. During the hour and half tour, we (14 of us, mostly young, British, Hungarian, Moroccan, American) learned about the history of the neighborhood, some hot button political issues, cultural icons, changes in the Hebrew language, verb forms and conjugations, Hebrew pluralization of plural words in other languages (jeans plural is jeanszim), and many new vocabulary words, all by reading signs and graffiti art and listening to and watching Guy extract every ounce of potential learning from them! Guy uses a small white board to teach along the way and he gave each of us a little notebook (pinkas in Hebrew) and a pen and he encouraged us to write down new words. (Sound familiar? Just what we do with Lior, our tutor.) Here he is at the beginning of the tour using his white board. If you went to Hebrew School in the 50’s and 60’s as I did, you may have painful memories of your teacher standing with his back to the class, endlessly and painfully conjugating verbs on the blackboard (this was before whiteboards), while students like my dear friend Lynn made fun of the teacher behind his back. Guy is NOT your old Hebrew School teacher and he doesn’t turn his back to his students! It is entirely different when you’re reading a flyer about a lost dog and your teacher takes the opportunity to have you translate the sign and teach you different verb constructions from the same root as lost- for instance to commit suicide- and to teach you that when you put “which” in front of a present tense verb, it’s preferable to use “the” instead, as the author of the flyer did. When learning in context, it sticks! 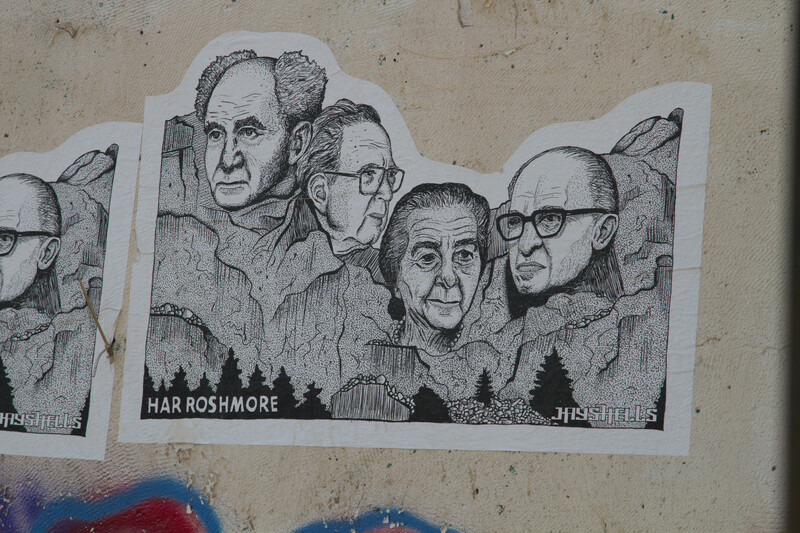 This graffiti art is called Mount Roshmore- a play on words because Rosh (as opposed to Rush) means head in Hebrew- and it portrays famous past leaders of Israel instead of America – David Ben Gurion, Yitzhak Rabin, Golda Meir, and Menachem Begin. Cleverly done. This one portrays the image of the frightened little boy with his hands in the air from an iconic photograph taken in the Warsaw Ghetto – a poignant and powerful symbol of the Holocaust. 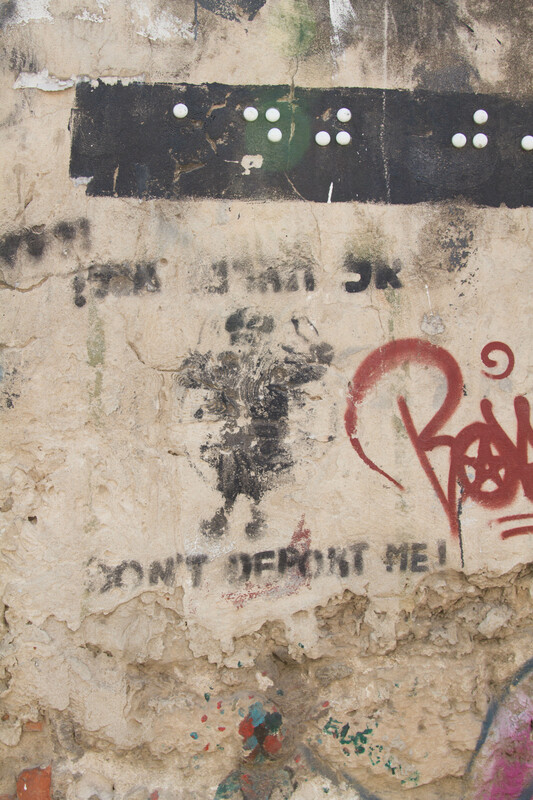 The writing in Hebrew and in English says Don’t Deport Me. One of Israel’s hot button, human rights issues right now is the right-wing government’s desire to deport the children of African refugees and migrant workers, many of whom have lived here most or all of their lives, speaking Hebrew and considering themselves Israeli while Jewish immigrants are welcome anytime from anywhere. How can a government built on the ashes of the Holocaust consider committing such an injustice? All that in one small piece of graffiti. The section of Florentin that is old one-story buildings is now mostly workshops and because the government plans to tear it all down, they tolerate open use of the walls there for graffiti and they are graffiti filled and fascinating to see . Here’s Guy and Chuck’s back in front of one such wall. One more example, especially for my favorite Zionist, Rachel. 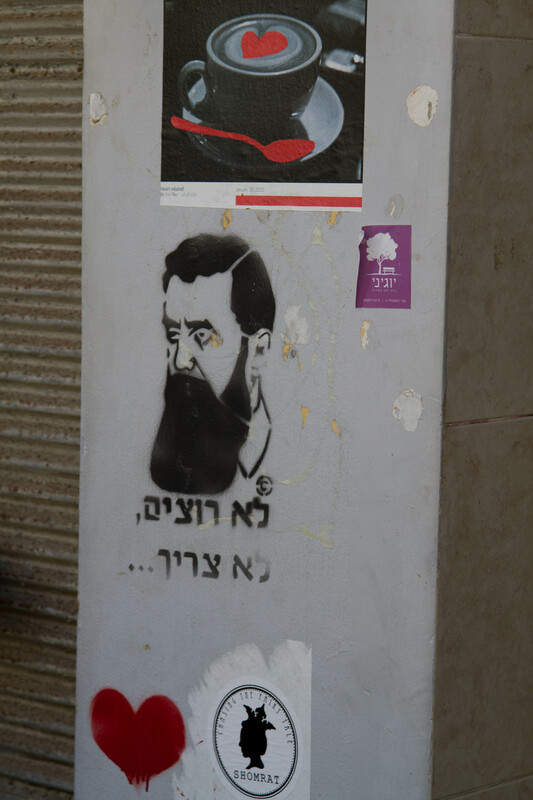 This is a portrait of Herzl, the founder of Zionism. One of his most famous lines about the future establishment of a Jewish state in Israel is “If you will it (want), it is no dream.” Under his portrait here, it says “if you don’t want to, you don’t have to.” We all laughed. 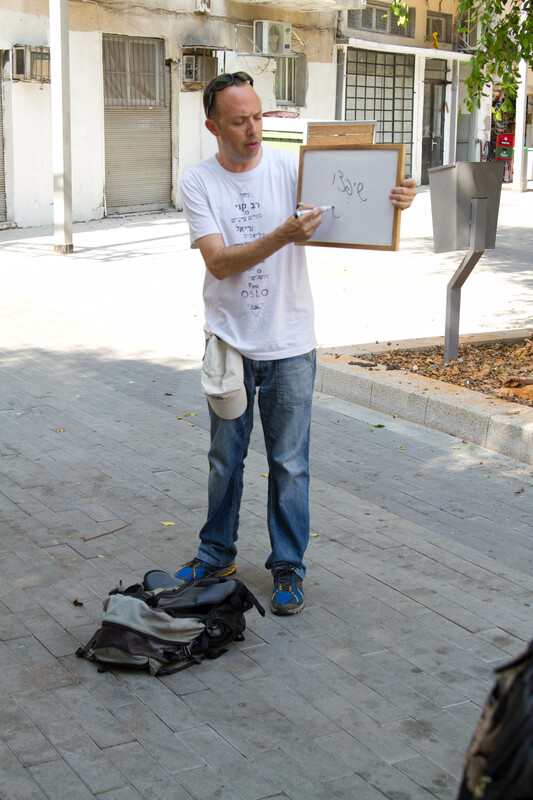 If you’ve got a basic knowledge of Hebrew, I highly recommend one of Guy’s tours next time you’re in Israel. He does a shopping-cooking one, a watching and discussing Israel’s version of American Idol, and a tour of the historic Trumpeldor Cemetery. All examples of learning the language and culture in authentic contexts. Sitting with Lior on our rooftop deck and talking about what we’ve done here (for instance my hair salon adventure) or how we practice Judaism is another form of learning in authentic context. I can proudly say we are now beginning to use and hear and understand the usage of many of the words Lior has taught us- yes! If it’s not too late when Chuck and I return from a late Saturday night stroll on Dizengoff Street, I plan to do another post on Israelis we’ve encountered. Such fun. I may be on leave from work, but I’m a teacher and a student of teaching no matter what. One goal Chuck and I share for this trip is to make some real progress in our Hebrew skills. Both of us had our Hebrew fluency heyday 40 years ago when we could read the newspaper fluently and understand the TV news and shows easily. Shall we say we’ve aged since then and been away from Hebrew? Being the competitive souls we are, we jokingly argue about whose Hebrew is better (truth is, mine is…) but we’re awfully close in our Hebrew skills. Both of us can navigate everyday life well (despite the language dance I wrote about before), but when we watch TV, they talk so fast we can’t catch a lot of it and when Israelis talk amongst themselves, forget about it. Furthermore, neither of us can talk intelligently in Hebrew about our work, politics, or any complex topic. As you’ve read, we’re working on our food ingredients vocab via menus and we found out that Petrozillia is parsley among others we’ve learned. Many restaurants have English menus too, and our strategy now is to ask for one in Hebrew and one in English and compare. We went to a lovely dairy restaurant for dinner the other night and when we compared the menus, we found there were things on the Hebrew one that weren’t on the English one. When we told the waitress, she said they hadn’t updated the English ones yet. So on all fronts, it was a good strategy since we ordered something that was missing from the English menu! In addition to our constant pursuit of sign, ad and flyer comprehension, we hired a Hebrew tutor, Lior Yatziv, who was recommended by my colleagues at Kibbutzim College here in Tel Aviv. Of course I assumed this was a man by the masculine form of the name (Liora is feminine), but lo and behold she’s a lovely young woman. She came for the first time yesterday morning and we sat out on our roof terrace for an hour and half of hard work that was fun. She’s a terrific teacher and I told her that was a high compliment coming from me. She started out telling us we were only going to speak Hebrew (YES!) and if we don’t know a word, we’re to try to explain it with other words rather than say the word in English and just ask for a translation. Once we make it relatively clear to her what we’re trying to say, she teaches us the new word. If we don’t understand a word she uses, we’re to ask. We now have a vocab notebook where she writes down our new words as we go along. She began by telling us about herself and then asked each of us to do the same. She got a big kick out of hearing about how we met in Jerusalem in 1969 when Chuck knocked on my apartment door and asked if he could take a shower. As we got further along in our stories, we had to try to explain our careers (kareera in Hebrew). 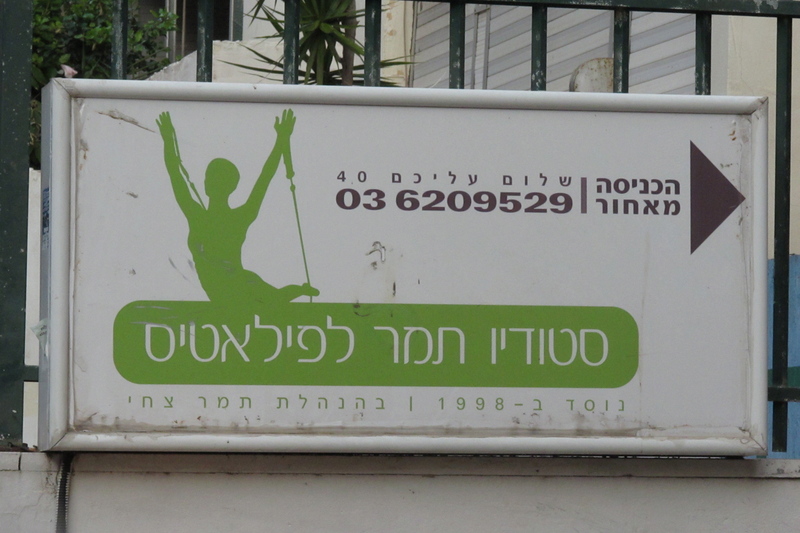 If one has trouble speaking the language, the expression in Hebrew is “breaking one’s teeth” and we sure broke our teeth, but we moved forward with Lior’s support and encouragement. When Chuck had trouble explaining what’s he’s done as medical director of large health insurance plans, I offered the following example in Hebrew: “He created methods for doctors to learn whether their patients have that disease that makes them very sad, so they can get better and this new procedure helped doctors find hundreds of thousands of people with the disease. ” Then we learned the words for depression, treatment, protocols (it’s protocols…), and Chuck remembered the word for population. We can now tell that story with the correct, intelligent vocabulary! When I told her I have been dedicated to urban education and social justice through teacher education, we learned that she identified (new word) with that because she volunteers with youth refugees from Darfur and we learned new words for non-profit, relief organization, homeless (it’s without a roof over one’s head, not without a home). We also learned the word for frustrated! The time flew by. Once she left, Chuck and I realized we couldn’t remember most of the words we had learned much to our distress. Plan B. We have found mnemonic devices helpful, so the word for complicated is moorkav and kav means line in Hebrew and more lines is more complicated. Now I’ve got that one fixed in my head. Whatever works I say! We’re also spontaneously quizzing each other during the day to try to cement our learning. It is obvious to both of us that our fluency is deepening, even though it’s only been five days here. What’s happening? First, immersion is at work. Second, we are actively trying to understand what we don’t yet know, using Google Translator, each other, and other people. Formally, Lior’s teaching was demanding and it had rules we had to follow, but she was encouraging and lively, and she spoke slowly without talking down to us. Writing down our new words was clearly critical to our learning as well, as was finding ways to remember the new words and quizzing each other. Lastly, her rule that we try to explain what we want to convey when we don’t have the exact word is very helpful in expanding our general fluency, even if it takes longer than saying the word in English. Tomorrow we meet with Lior again and on Friday, we are going on a Graffiti tour with a linguist, Guy Sharett, who was written up in the NY Times. He has a fascinating website called www.streetwisehebrew.com and he was a delight to talk to when I called to reserve spots on the tour. He insisted we speak Hebrew and he wanted to know about us, what we’re doing here, and why I didn’t just sign up on Facebook. Am I the last person standing (actually the last two along with Chuck) who isn’t on Facebook?! It’s never been a problem, but lately it’s been inconvenient a few times. Let’s see how long I hold out on that front. Anyway, I’m sure I’ll have a post about the Graffiti Tour along with photographs by Chuck after Friday. Graffiti is big in Tel Aviv, so this should be good. So much fun even with breaking our teeth! 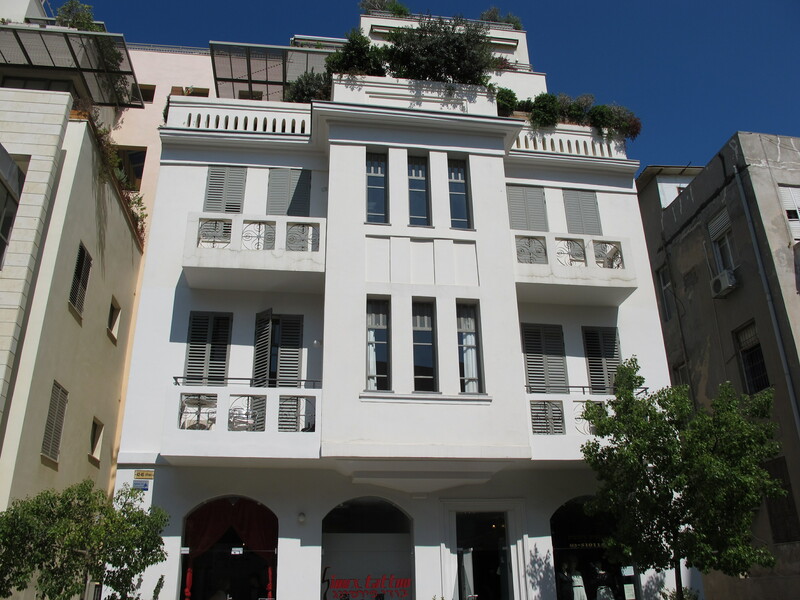 and two small museums that were the home of a famous painter (Reuven Rubin) and a famous writer (Chaim Nachman Bialik). We had our first Falafels of this trip today- delicious street food. We eat some meals in our apartment and that feels better than eating out all the time. We found a takeout kosher Chicken rotisserie place and had that at home one night, and salads, cheeses and fruits for lunch work well. Chuck had a lesson with a photographer today and he learned new Photoshop skills and new ideas for what to shoot with his camera. 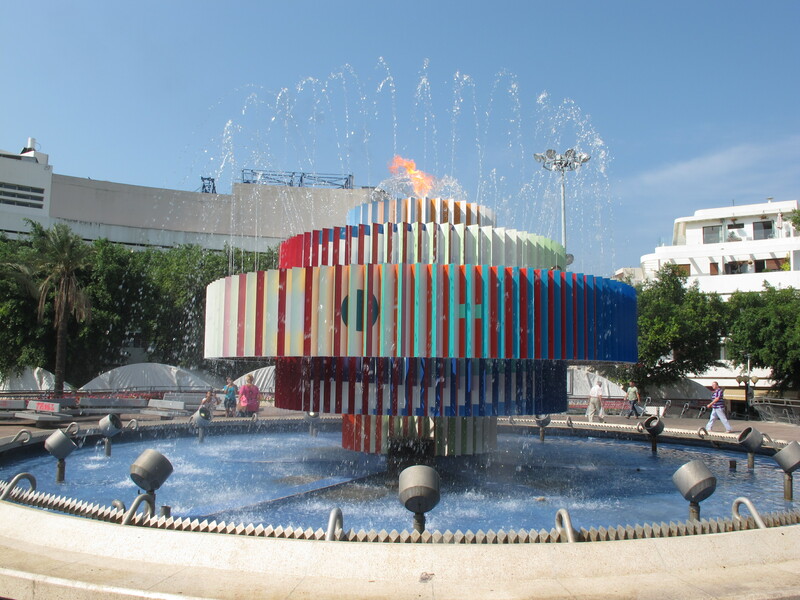 Yesterday, we went to see the music, fire and water show at the Agam Fountain on Dizengoff Square. 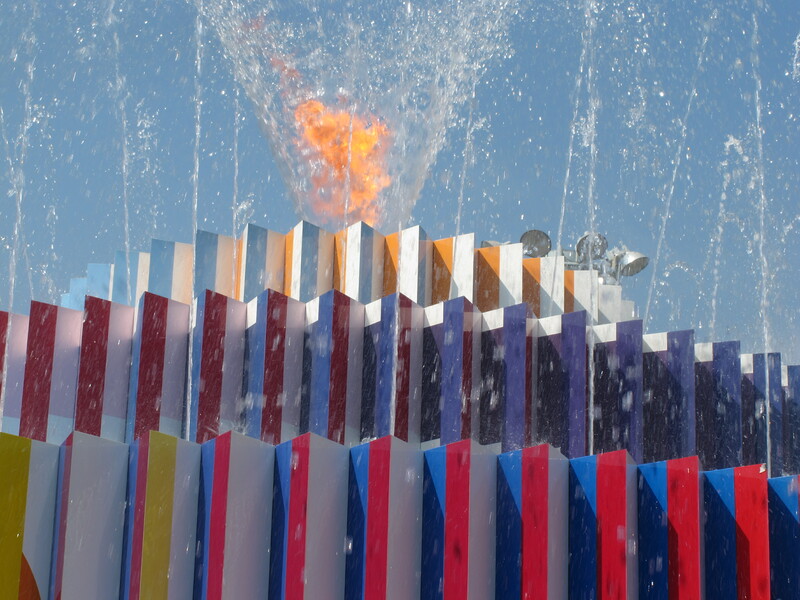 Agam is a famous, modern Israeli artist and as in most of his works, the fountain parts change colors as it rotates. Watching the show made me smile widely and I actually got emotional, feeling the incredible good fortune and privilege it is to be able to be here in this way. Once David teaches me to upload videos to YouTube, I’ll attach a video of the fountain with the music. I promise it’ll be worth your time! I am so happy, it’s hard to describe. One of the reasons is I feel like a kid again, the 20-year-old who came to Israel for a year when everyday was new and an adventure. It’s a wonderful feeling. On top of that, I didn’t meet Chuck until the end of my year here (on July 5, 1969 to be exact), but this time I have him here for my entire visit- how great is that?! Israel is an incredibly diverse society. In addition to the Jewish immigrants from the former Soviet Union, Ethiopia and South America (we hear Spanish on the street a lot) there are the native Arabs, the long-time Israelis from Yemen, Morocco, Iraq and Iran and now the migrant workers and refugees from Africa, the Philippines, and Thailand. (Right next door to the cafe was Thai Touch, a massage parlor that looked on the up and up- someone was getting a foot massage outdoors..) Among the Jews, you have the religious, the ultrareligous (very different garb distinguishes them visually), the fashionistas, the outrageous dressed or undressed (Chuck asked me if one woman walking by was actually wearing any legitimate clothes at all…), Hippies, students, and the Russian grandmother look with red hair and old fashioned clothes. When I was a child, grandmothers had blue hair, but now Russian grandmothers seem to have red hair and I mean red. What fun for inveterate people watchers like Chuck and me. On the street right by the restaurant, was an ad for an American movie. Can you tell what movie it is? You’re right if you guessed The Oranges- a movie about our hometown! What an orange peel-like object with a zipper has to do with that, I don’t know. When Chuck took off for an appointment with a doctor who runs a hospital in the suburbs, I took the opportunity to wander around the neighborhood again. Since I had postcards to mail, I found a post office to buy stamps. What an experience! It was the most sophisticated post office I’d ever seen. When I walked in, I thought I was in a clinic and had made a mistake because there were rows of people just sitting there and waiting patiently. (That’s very un-Israeli.) Then I heard a computer voice call out a number and someone got up. So I asked someone where to get a number and he pointed to an elaborate kiosk where you have to choose what you want to do (mail a package domestically, mail one abroad, general business) and then each category has a different number series. I got number 91, and although they were on 75, my wait was only about 5 minutes. But, I observed that if someone didn’t immediately rise when a number was called, the computer voice went on to the next number. How did the voice know if someone had gotten up?! (O.K., one of the clerks must have been operating the system, but it felt like the voice was in charge.) When number 90 was called, I got ready and jumped up when they called 91. After I got my stamps, I moved away and got ready to lick a stamp to put on a postcard. The clerk who had helped me motioned to me to come back and she said (in Hebrew, the whole transaction was in Hebrew thank goodness), “That tastes awful. Use this.” and she took out a stamp-wetting pad for me. How nice! Would a clerk in a US Post Office ever do that? Not that I think I need my usual Pilates workout- walking miles everyday and climbing our stairs 2-3 times a day is more than enough exercise right now! The neighborhood is full of hair salons and manicure places (Is it so all over the world, or does it just seem like it?) and once I have “my” places to “to do a fan” (literal translation for getting hair blown dry) and get a manicure, I’ll really feel at home. Do you sense a theme here? Israel always feels like home to me in both profound and simple ways and Chuck feels the same way. At dinner last night we speculated about what our lives might be like if we had moved here (made aliyah as it’s called) 40 years ago when we seriously considered it. It’s impossible to know, but fascinating to think about. Our landlord stopped by last night. He’s a 50 year old Canadian who made aliyah with his family 5 years ago, although his maternal grandparents came to Palestine at the beginning of the 20th century from Poland and his grandfather built and owned this whole building. He said, “Why not make aliyah now? It’s a great place to retire.” I said I could never leave my children and grandchildren and parents and he said,”They’ll follow, don’t worry.” For sure I know at least one who is game, but other than Rachel (surprise, surprise), I’m not so sure there would be any takers. Oh well, we’ll just have to keep visiting. Rachel suggested we consider buying a second home here- not exactly as convenient as the Berkshires, but so much more exotic! 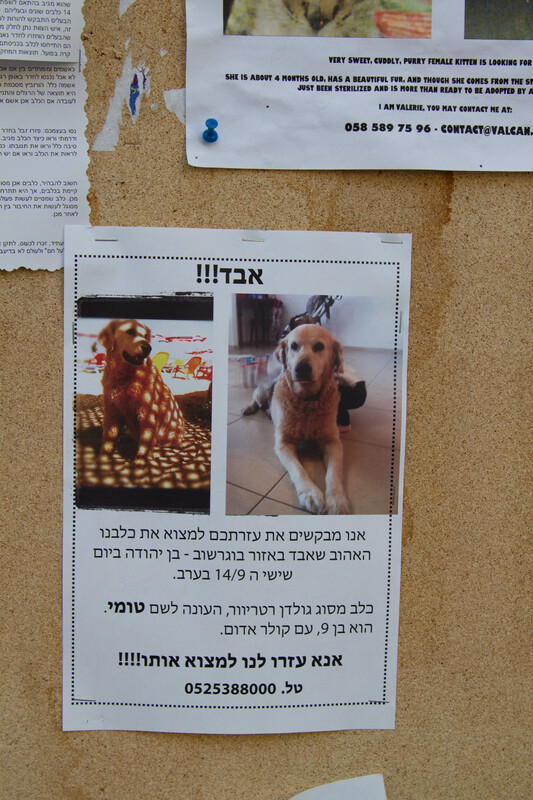 Needless to say, it wouldn’t be an apartment in Tel Aviv given the prices I wrote about yesterday. But otherwise, who knows?! Stranger things have happened and in any case, I can dream. Today we wandered through the Yemenite neighborhood, built 100 years ago when Tel Aviv was founded. It’s a warren of narrow streets named after famous Rabbis and founders of the community, along with one street named Al Konfei Nesharim (On the wings of eagles- referring to the line from Isaiah that those who trust in the Lord will soar on the wings of eagles), which was the name given to the airlift of Jews from Yemen when Israel was established. The neighborhood is a mix of very old, dilapidated one story buildings, and new and renovated buildings. It was so interesting just to keep turning up and down the streets. On some of the narrow streets, there were restaurants taking up the whole street with outdoor tables, with the kitchens truly holes in the wall. There were lots of customers at some of them, so we decided to try our luck. When we asked for a menu, the waiter said he was the menu. It was a hummus only restaurant. Chuck had hummus with masbacha (with whole seasoned chickpeas) and I had hummus with mushrooms. Both of us had Yemenite hard-boiled eggs with it- they are cooked many hours in a pot with other foods and the whites are dark. It was an adventure in ethnic eating. Here I am. The leisurely pace we have adopted given our lengthy stay allows us to observe and learn as much as we can. 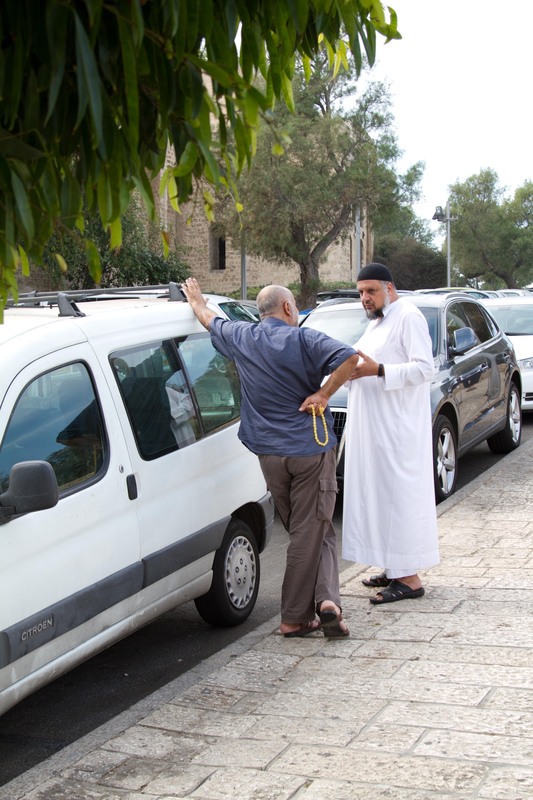 For instance, as we sat at the outdoor restaurant, we saw four different elderly Yemenite men- two religious with kippot, one in cut-off pants with a Florida shirt with palm trees, and one dressed conservatively- but they all kissed the mezuzah on their doorposts as they left their houses. Tradition transcends present practice. For Chuck and me, it was sweet to see because his Dad, Leo of blessed memory, used to kiss the mezuzah outside their apartment every time he went in and out. Another example of our watching and reading was a notice taped to a pole offering Tutoring in Mathematics from an experienced teacher, with good interpersonal skills and an MBA. It had the usual rip-off tabs with her phone number and we could translate the whole thing. We are always proud of ourselves when we can understand every word in a sign or flyer- it doesn’t happen that often! Our apartment is about 1/4 of a mile from the sea. 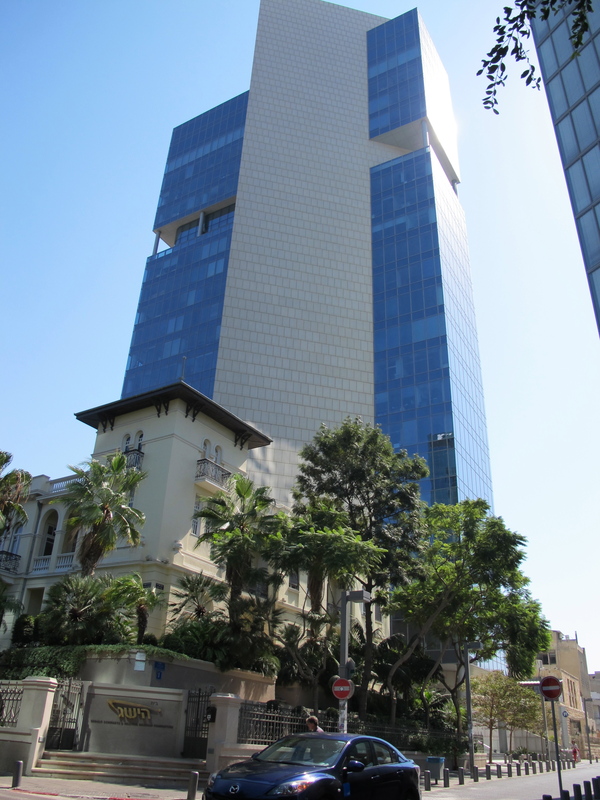 For those of you who know Tel Aviv- we live on Mendele St.- which runs west from the beach right at the Dan Tel Aviv Hotel. We can walk anywhere from here except to North Tel Aviv where the University, Kibbutzim College, and the river where Chuck wants to row are. Here’s the view of the sea we see as we approach from our street. Notice the lovely man in the bikini Speedo bathing suit. What you don’t see is that right before him, a Hasid in full black regalia passed by. Too bad we couldn’t get a picture of that Israel contrast. Among the many things I love about being in Israel, is Shabbat in Israel. We arrived two hours late due to a series of bizarre delays at Newark Airport. When we got out of the taxi and met the woman who takes care of the apartment we rented, her first concern was that we be able to get food for Shabbat. It was 3:20 and Shabbat was going to begin in two hours. She showed us where the Shabbat candles and matches were in the kitchen, along with the candle lighting time chart. We quickly went out to the mini-mart a few blocks away, and found something else I love about Israel, the fresh, healthy food. It was a mini-mart, but the produce was fresh and delicious, as were the various eggplant salads and cheeses we bought. I wandered down the block to a little flower boutique and a lovely young man made me a Shabbat bouquet, while reminding me that “There is no Shabbat without flowers.” We began the typical language dance done here. 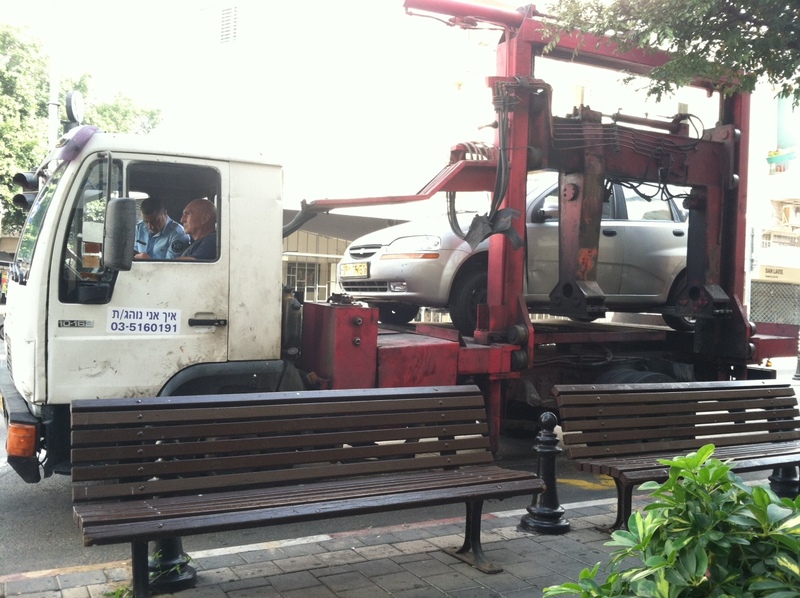 (This is one of the things that annoys me in Israel!) When you speak Hebrew with an American accent and look American, Israelis will answer you in English, which they love speaking. 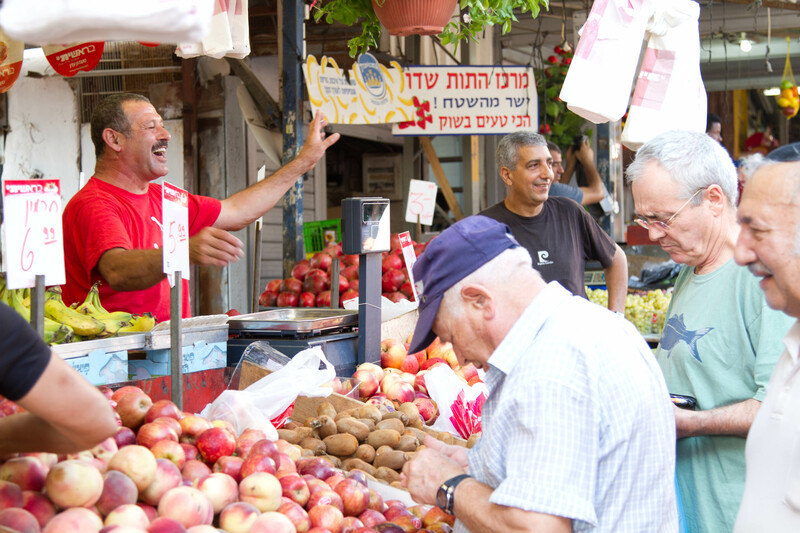 After a few exchanges with the flower man where he spoke English and I spoke Hebrew, I told we were living here for awhile and I would appreciate it if we could both speak Hebrew! He enthusiastically agreed, also letting me know there’s a discount if you buy flowers every Shabbat and he can have a bouquet ready for me at whatever time on Friday we set. Two exchanges later, I had to remind him to speak Hebrew. We both laughed. Everyone we met, buying food, flowers and wine wished us Shabbat Shalom, which is the standard greeting on Friday and Saturday for secular and religious Jews. I do love Israel. Chuck and I had a lovely Shabbat dinner in our cute little apartment and we said the Sheheheeanu prayer, thanking G-d for protecting us and bringing us to this moment of spending Shabbat and this month in Israel. We have an enormous roof top patio (That’s the good news. Bad news is our apartment is on the roof- four stories up and no elevator. I am going to have very strong legs when we leave. My fit husband carried my 50 pound suitcase up, but even he was sweating.) and a back patio where the washer and dryer are. 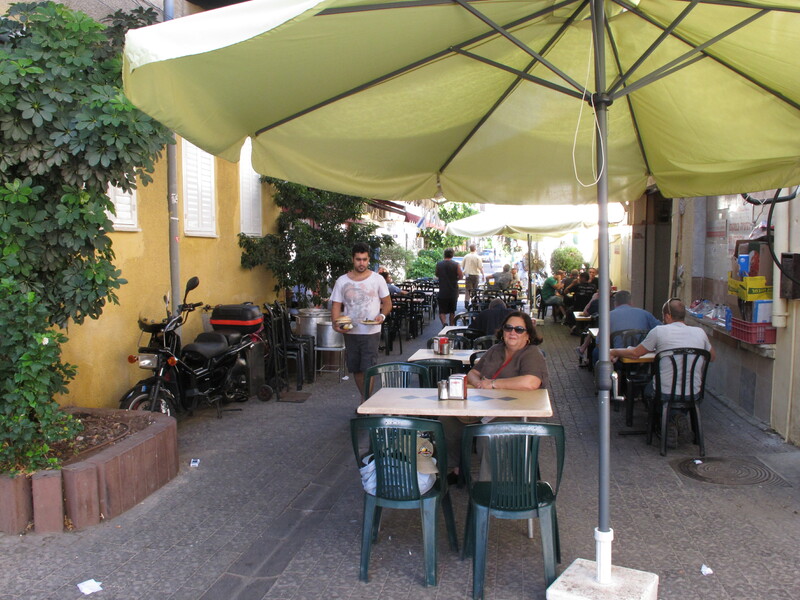 Our little street is very quiet, but it is right in central Tel Aviv- a few blocks from the sea. A perfect location. Neither of us slept well- both up around 2 a.m. wandering around the apartment. But we went back to sleep and slept until after 8. I hear it was very cold in NJ today- here it was 86 degrees and sunny. We walked and walked today- over 4 miles- and took part in a free English walking tour of the Bauhaus buildings in old Tel Aviv. One thing we learned is that the brown marks in the stucco of the buildings on tree lined Rothschild Blvd. are from the bats that feed on the trees at night. Yuck. Some of the beautiful buildings have been renovated, others are quite dilapidated. 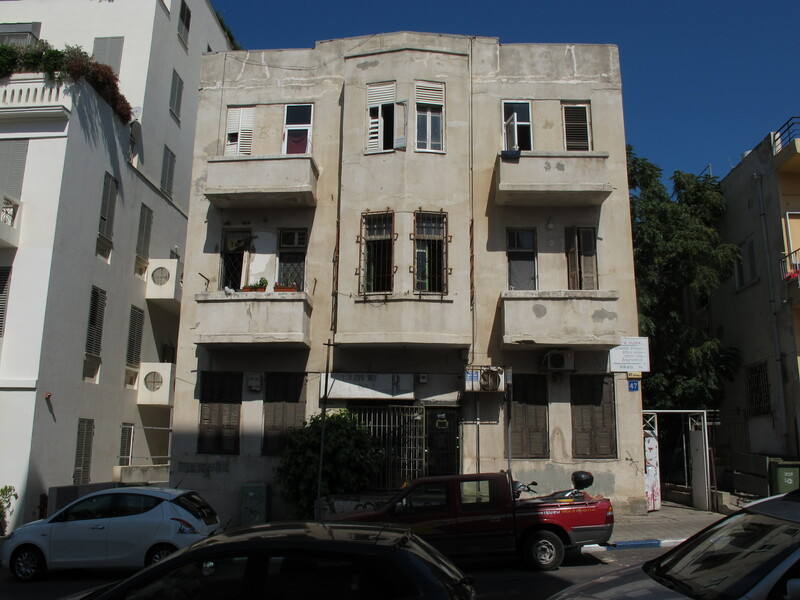 Since Tel Aviv was named a Unesco Heritage Site, the buildings can only be renovated to match their original plans, with the exception of adding floors that can’t be seen from the front. Our building is one of the original ones and our apartment is the penthouse, added in 2005, but it can’t be seen from the street. Often high rises are right next to 3 story buildings, creating the kind of visual contrast Chuck loves to photograph. Everywhere we wandered we read and tried to understand signs and menus. The latter was comical. One menu had a list of sandwiches, with ingredients, and every one had geebatah as the first ingredient. What was geebatah?? It was Ciabatta bread! We haven’t yet figured out what Petrozilla is though. We played the language game a few more times, but on occasion, much to our delight, the Israeli in question just spoke Hebrew with us. 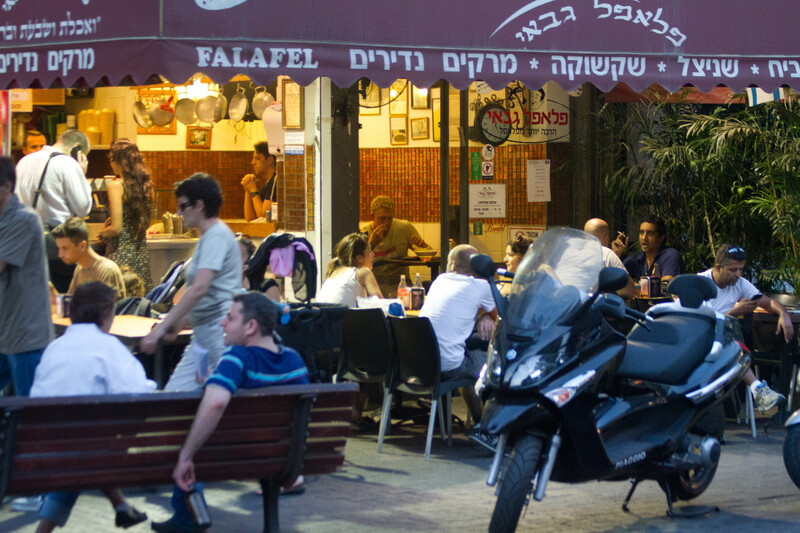 Although Jerusalem is completely shuttered on Shabbat, Tel Aviv is different. Most restaurants (obviously not the kosher ones), coffee houses, and some stores are open. Everywhere we walked, we saw young couples with babies, pregnant women, and gay men. Those groups dominated the outdoor scene dramatically. 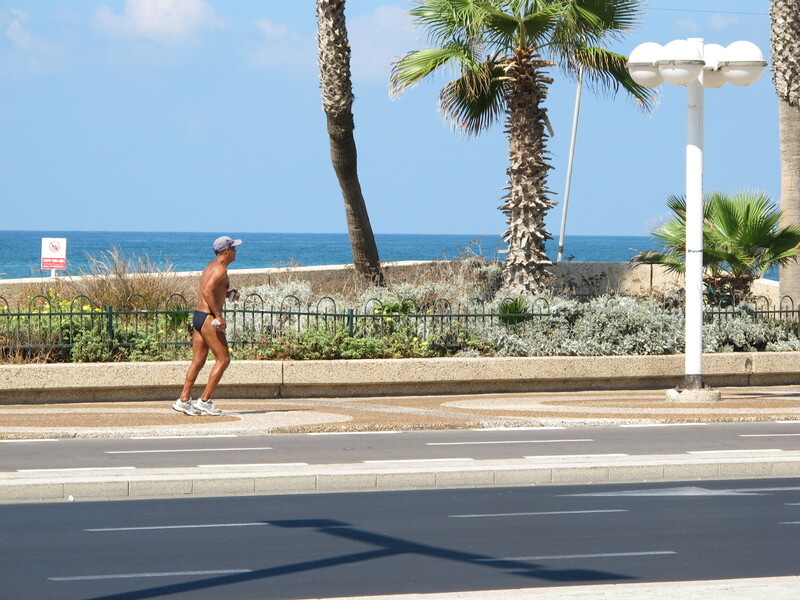 This is not your grandmother’s Tel Aviv. We love listening to little kids speak Hebrew and we also love that they don’t answer us in English if we speak to them in Hebrew! Israel went off daylight savings time a few weeks ago, so Shabbat ended early. The doors to our porch are open and we hear the sounds of little children outside. We just Facetimed with our grandchildren at home and spoke to Mom and Gene. Lovely to hear and speak to them. We walked the iPad around the apartment and showed the kids- Lior approved but mostly wanted to know about cars in Israel. 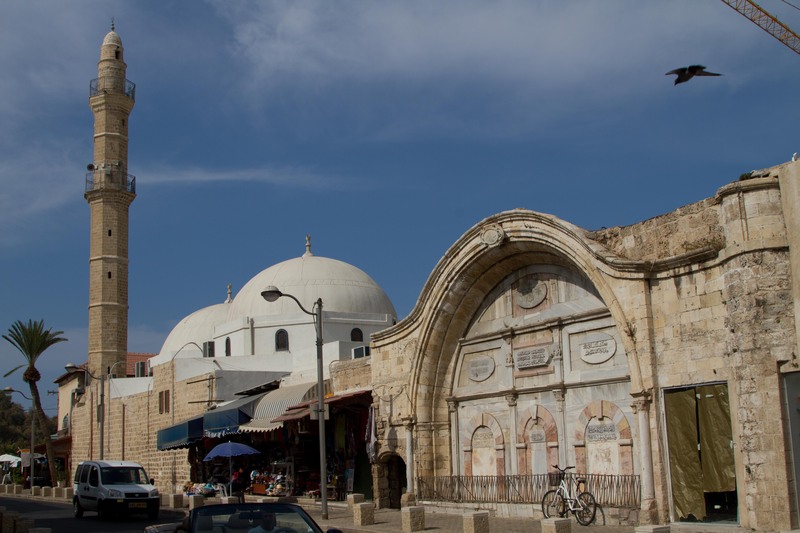 Asher said, “My want to go there with Saba and Savta.” It is such a contrast to my year long sojourn in Israel in 68-69, when I had no phone all year and had to make an appointment at the Central Post Office to call home! We came with an entire suitcase of electronics- three computers (Chuck has his own and his work one), two iPads, various connectors, and three phones (two Israeli and Chuck’s work cell phone.) When Chuck and I came to Israel together in 1972 as part of our 10 week honeymoon, we each had one back pack for the whole trip. Just my toiletries would be too much for that backpack now! Love to you all from Tel Aviv- we are off to dinner on Sheinkin Street.